Regarded as one of the most knowledgeable basketball broadcasters in the business, Packer’s love for the game blossomed at Wake Forest University where he led the Deacons to two Atlantic Coast Conference titles and into the Final Four of the 1962 NCAA tournament. He scored a career 1,316 points. His broadcasting career started in 1970 doing high school football games. He made the big time five years later when NBC hired him for the NCAA regional playoffs. He has broadcast basketball for CBS since 1982. Billy Packer is a man with lots of opinions. His outspokenness has gained for him, and college basketball broadcasts on CBS-TV Sports, a huge and devoted following. “When I was assistant coach at Wake Forest, the head coach didn’t like to do things on radio. The first time I was on the air, the station asked me to do post-game comments after we played Duke. We had lost the game in overtime. And we had a chance to win it at the foul line. “My comment was that when you have an opportunity to win a game, you tighten up your jock strap and you make those foul shots. You do not miss them. I don’t care if you’re a foul shooter or not, you do not miss the foul shot. Packer – his Polish name is Paczkowski – grew up in a basketball family. His father, Anthony, was the men’s basketball coach at Lehigh University. Billy earned Pennsylvania All-State honors in basketball in his senior year in high school in 1958. At Wake Forest, he earned All-ACC honors (1960-62). He led the Demon Deacons to three ACC titles and into the Final Four of the 1962 NCAA tournament. Wake Forest finished third in the tourney after losing to the eventual national champions, Ohio State. In 1965, he began a five-year stint as an assistant coach at his alma mater. He finished his basketball career with a total of 1,316 points, fifth leading scorer in school history at the time (he’s eleventh now). Packer “tightened up his jock strap” to sink the winning free throws in a Dixie Classic tournament championship game his sophomore year. He kept Wake Forest alive in the 1962 Eastern Regional with two baskets in the final 18 seconds of regulation against St. Joseph’s. Packer’s broadcasting career started in the fall of 1970 doing high school football games. He made the big time in 1975 when NBC hired him for the regional playoffs of the NCAA tourney. He stayed with NBC until 1982 and moved to CBS when that network outbid NBC for the rights to broadcast the NCAA championships. Packer has been inducted into the North Carolina Sports Hall of Fame, the Wake Forest University Hall of Fame, and has received the Curt Gowdy Award from the National Basketball Hall of Fame. 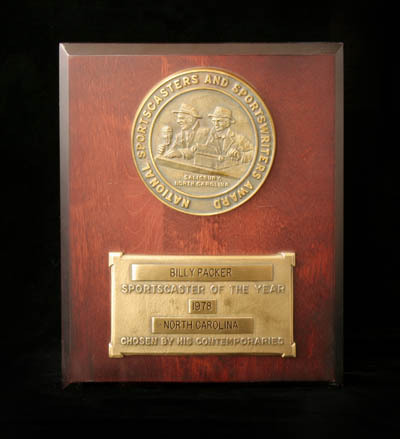 In 1993, he earned the Sports Emmy Award for Outstanding Sport Personality/Analyst. “When it (broadcasting basketball) isn’t fun anymore, I’ll quit,” Packer has been quoted. “I can’t sit there and lie to people.” His legion of fans hopes Billy Packer keeps on having fun for many years to come.